Diepenbrock composed the Academische feestmarsch (Academic Festive March) in the spring of 1882 at the request of the Amsterdam Student Fraternity for the upcoming celebration of the fifth anniversary of the University of Amsterdam. The university was the successor of the Athenaeum Illustre which was founded in 1632 and was commemorating its 250th anniversary. Diepenbrock completed a piano version of the work in two weeks (1-15 May). It took him almost another month to finish the orchestration. The nineteen-year-old composer combined a traditional rondo form with the melodies of two student songs: Io vivat, created in the university town of Leiden around 1800, and Gaudeamus igitur, of which the first three verses of the current version - it is based on a thirteenth-century poem - had already been popular in academic circles since the beginning of the eighteenth century. The premiere took place in the garden of the Palace for Industry on 20 June 1882, at a “Grand Military Concert” by the Royal Military Band of the Grenadiers and Guards Rifle Regiment, conducted by J.H. Völlmar, as part of the festivities. The Academische feestmarsch opened the programme. Diepenbrock was laurelled by the rector of the university on behalf of the fraternity. On 22 June it was performed again at a musical matinee at the same venue. The students appreciated it that Diepenbrock quoted the Io vivat, and the festive march was greatly applauded. (BD I:522). We can only guess what Diepenbrock’s orchestration for military band sounded like, as the final score from which the piece had been conducted was lost in a blazing fire in the regiments’ quarters in the Alexander Barracks in The Hague on 6 March 1919. We are left with the incomplete semi-autograph A-1, a preliminary version of the work with on several pages just the main melody notated on one stave. 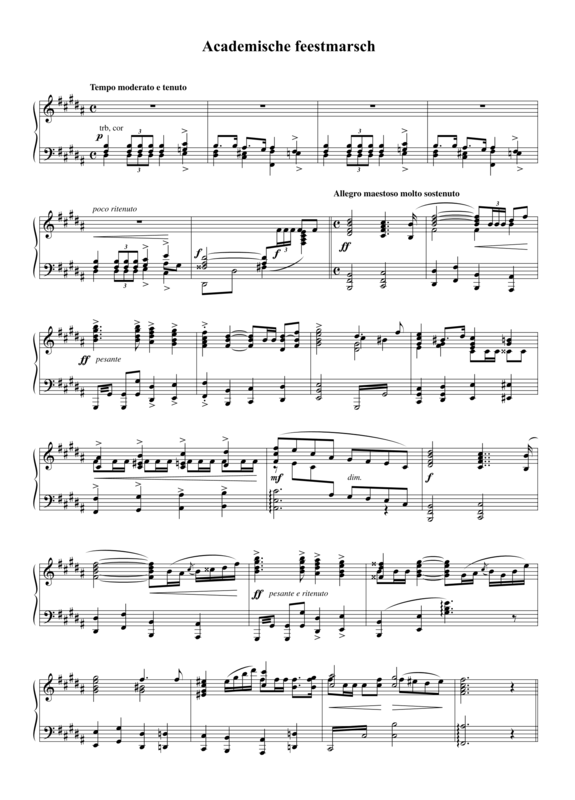 The piano version that was published in December 1882 reveals some details of the orchestration, as occasionally it names one or more of the instruments that give the passage in question its character. We do not know whether from the very start the composer set out to orchestrate the piece for military band all by himself, but a letter to his mother (BD I:73) suggests that Diepenbrock consulted Jacob Kwast (1820-1890), who gave lessons in choral singing, piano and composition, about it from mid May 1882. Part of the surviving semi-autograph is by him. As at the first rehearsal by the Royal Military Band Diepenbrock was shocked by his music; it had greatly affected him (BD I:26), we could conclude on the one hand that the composer was entirely overwhelmed by his own music, on the other that beforehand he only had an overall idea of the effect of the orchestration. Thus, most of the instrumentation must have been done on Kwast’s directions. The following repeat of the refrain develops into a pompous coda, in which first the Gaudeamus igitur and then the Io vivat are played in their entirety. In the final measures the refrain returns (now Allegro con brio), to suddenly be cut short by a brief and powerful “hoezee, hoezee!” (hurray, hurray!) expressed by the four final chords. However, the melody of the second contrasting episode of the Academische feestmarsch has the characteristics which were later to give Diepenbrock’s songs such individual character.